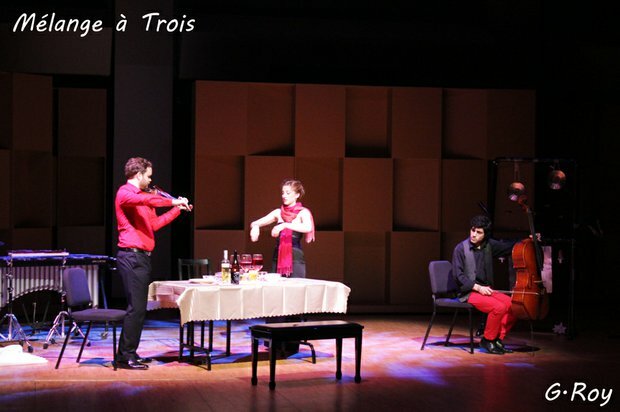 MÉLANGE À TROIS is an instrumental theater work, set for violin, cello and percussion. In this voiceless opera, each musician embodies a character in an enchanting tale of misplaced love. After first hearing Krystina Marcoux’s fiery, solo performance of Jennifer Higdon’s Percussion Concerto back in 2013, it was with a lot of anticipation that I attended Luna Pearl Woolf’s original voiceless opera Mélange à Trois with the BIK ensemble last Friday, May 16th at McGill University’s Pollack Hall.